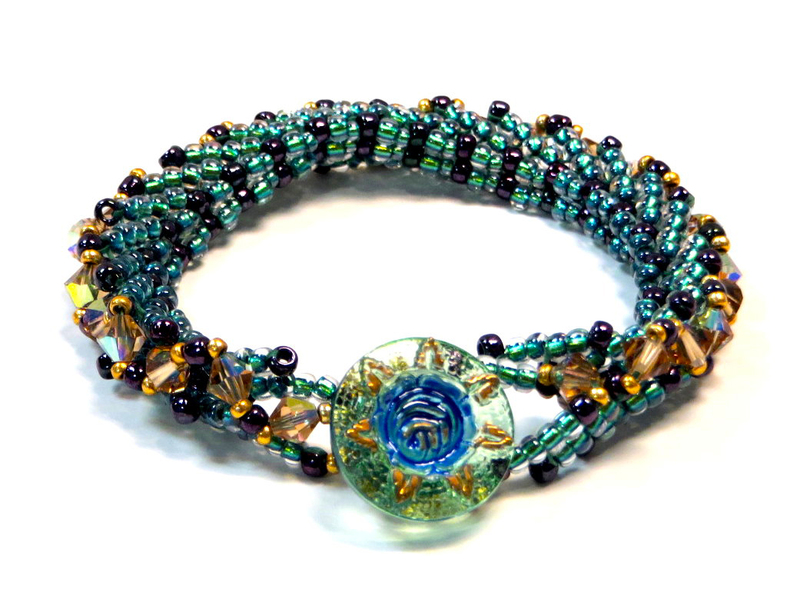 Click the button below to add the RUSSIAN CHAIN STITCH BRACELET KIT, (1 unit) to your wish list. Simple elegance! Stitch the Petersburg Chain and Simple Russian Chain techniques to encase a cascading array of sparkling Austrian crystal beads within this rope bracelet. NOTE: Regular retail and wholesale store discounts do not apply to kits. View Warren as Guest Artist on JTV.com Jewelry Television's show "Jewel School"
as he discusses this specially adapted projects for Jewelry Television. PLEASE NOTE: Sometimes, because of erratic supplies of beads and other materials, we will need to substitute something of similar color and quality. Colors may appear differently on different monitors. I was at a point in time where I had to develop a new Petersburg Chain project for our classes. The Traditional project, I felt, had been done to death, and while very appealing, it was no longer anything special. The project had to be relatively simple, yet elegant and sophisticated, and truthfully, had to be more appealing than the traditional project design. So, I used a more prominent bead to connect the two strips, then turned this project into a rope by connecting the sides together. I am very focused on redefining bead weaving stitches in architectural terms. At the core, this means determining what about the stitch is supportive of “shape”, and what about the stitch is supportive of “movement, drape and flow.” It became clear that every pair of Petersburg Chain Stitch rows is connected with what functions as a “box joint”. Based on this understanding, I developed a simple Chain Stitch, also relying on the architectural properties of a “box joint”. I used this simple Russian Chain Stitch to connect the two sides of the bracelet into a rope. 5. Understanding How Jewelry Functions in a 3-Dimensional Space, Sensitive to Position, Volume, and Scale, Interacting with People (Wearer and Viewer), Touching Simultaneously on Aesthetic, Cultural, Social and Psychological Levels. 10. Advocating for Jewelry as "Art" and as "Design"